I drive in a rainbow. It's been nearly a month since I updated this blog and I'm sorry for that. I have new photos that I'll post up tonight, but I'll catch up a little before I go to class this morning. My calculus class started again - this semester I have 6 new students, all of whom appear to be good kids and highly intelligent. I'm actually pretty excited for this group because I have a much better understanding of how the class needs to be structured and flow through the semester. That being said, I still gave a quiz on the first day of class - it didn't go so well. Mostly the purpose of the quiz was to show the students I mean business and that they're going to be working, hard, for their grades. I intend to keep them up to date with their homework this year by quizzing them on each due date - last semester I couldn't get all 4 of my students to hand in homework on the same day, this time I won't let that happen. 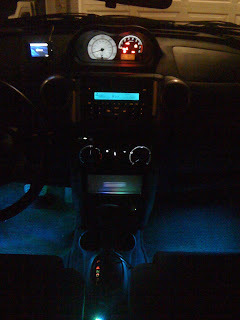 Beyond that I've been installing some new lights in my car - most of the lower half of the dashboard lights up and changes colors - I'll attempt to get a nice HD video up to show off the effect, it's actually pretty stunning (and not quite done yet!). I've been busy, but it's been a nice busy - the best part of the last month was Valentine's day with Bunny; we had a really nice time going to the planetarium at the Academy of Sciences and eating at the restaurant Chaya Brasserie. Also, please notice that I've made my twitter posts front-and-center of this blog - those are updated far more frequently now and I do link to photos, etc on those posts.